The Wells Fargo Center Office Tower, part of a large LEED certified mixed-use project which is redefining Norfolk’s town center, will welcome visitors into its lobby with the intriguing glow of Mercury Onyx DURA-Lite™ stone panels. The unique backlit Mercury Onyx, featured along the reception wall and on the lobby’s multiple four-sided columns, commands a presence that is simultaneously bold and inviting. The columns presented a typical challenge found in backlighting; little space for which to support stone and to throw light. With our thin Flat-Lite™ LED Panels and translucent DURA-Lite™ stone panels, GPI engineered a maintenance-free system with even backlighting and no structural interruptions. 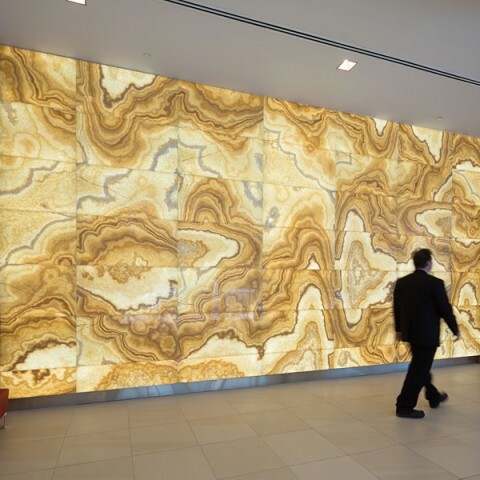 The result: large panels of evenly backlit natural onyx surfaces within overall assembly depth of 2.5 inches. Clancy & Theys Const. Co.